Robinson (top) and Stenson are each charged with three counts of robbery. Two men have been charged with committing three armed robberies last Saturday night—one each in Lincoln Park, Lakeview, and North Center. 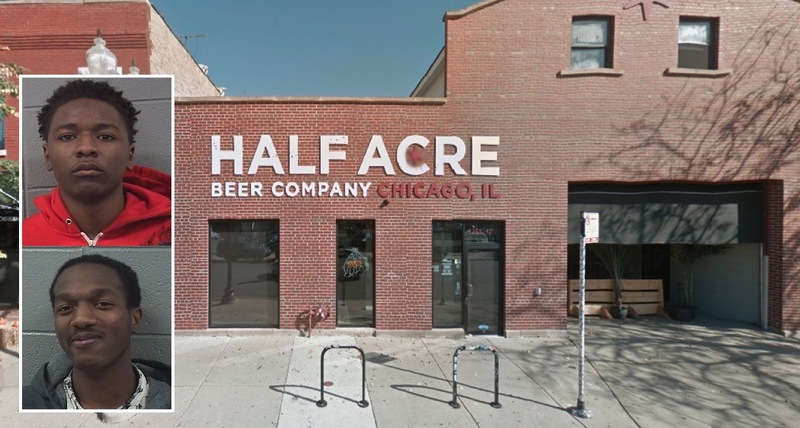 19-year-old Reginald Stenson of Evanston and 18-year-old Daveion Robinson were arrested at 11:20 p.m. on Saturday, about an hour after they robbed a Half Acre Beer Company worker on his smoke break behind the 4200 block of North Lincoln, police said. The brewhouse worker complied and all three robbers fled the scene. An alert police officer stopped the trio about 30 minutes later in the 4600 block of North Damen after seeing them with masks on their faces, authorities said. Cops said they found the brewhouse worker’s cellphone and credit card in Robinson’s pants during a custodial search. Also found in his pockets were a Samsung Note 5; an iPhone 6; and a Ventra card belonging to a man who had been robbed about two hours earlier in the 1900 block of North Dayton, police said. Investigators also determined that some of the property in Robinson’s pants belonged to a sportscaster who was robbed at 9:45 p.m. Saturday night in the 1200 block of West Roscoe, records show. Police said Robinson is a self-admitted Gangster Disciple street gang member. Court records show that Stenson was sentenced to two-years probation in February after he pleaded guilty to burglarizing a social service agency in Uptown of its master keys and multiple Ventra cards. Since February, the state has asked to have his probation revoked twice: once after he was accused of burglarizing a CVS in Oak Park; and again after he pleaded guilty to trespassing at Northwestern University. The state’s request was denied each time by Judge James Obbish. On October 6, police responding to a late-night burglar alarm at Casey Moran’s bar in Wrigleyville allegedly found Stenson walking out the back with two bottles of liquor. He was charged with theft of lost or mislaid property and released to await trial. Both men have been charged with three counts of robbery with a dangerous weapon. A judge this week ordered them held without bail. No further information was available about the juvenile.